The older pipes worked just fine for many years, but at some point they do wear out due to rust and age. Over the years, technology has really improved plumbing. There’s water-saving technology, water filtration systems, and new materials for fabricating and lining pipes. For older plumbing systems, however, there are many problems that can occur. The older pipes worked just fine for many years, but at some point, they do wear out due to rust and age. Here are just a couple of the things you should keep a lookout for in your home’s plumbing! If you have trees on your property, you should definitely be mindful of how close they are to your pipes. The roots of the trees can grow into and around the pipes. This can cause clogging and backups and sometimes even pipe breakage. A video plumbing inspection can tell you if you have tree roots affecting your plumbing system. Most older homes have the older-style cast iron pipes. Iron is extremely prone to rust, especially if you add the moisture of carrying water. 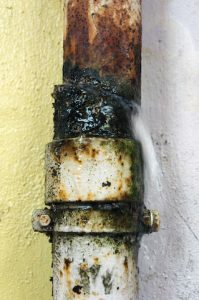 Rusty pipes can lead to a myriad of health and safety issues. Rusting makes the metal extremely brittle. Since rust is brittle, there is a high potential for burst and leaky pipes. This can cause extensive moisture-related damage to your home. If you live in an older home, you will probably notice at some point that you are starting to lose water pressure. This can have many causes but is often caused by mineral deposits inside the pipes. These calcium buildups are most common in areas where there is hard water, particularly homes that depend on a well for water instead of a public utility. A water softening filter can help prevent this, but it’s something you may want to watch out for. This entry was posted on Friday, April 13th, 2018 at 4:10 pm. Both comments and pings are currently closed.